An hour before the start of the game a group of LX stood outside the 15ft fencing talking to their Navy hosts, about the best strategy to deal with car parking. It was decided to accept the offer of parking inside the perimeter and, from the description, much nearer the pitch. After collecting car numbers, being checked by guards and eventually parking, the group then discovered that it was necessary to walk all the way back to the guardhouse in order to circumvent the fencing. Ideas about chucking kit over the latter were abandoned, given the height and the possibility of it getting caught on the top. What other initiative tests would the Navy throw at us we wondered. Well, the suggestion that the hosts would produce a side of players who were either retired from hockey or playing with injury, didn’t seem to have reached the individuals warming up. Perhaps the four withdrawals at the start of the week had been replaced by younger, faster, fitter men. The start of the game was very even, all looked well, no need to worry. That held good for the first 15 minutes. The difference was the Navy had a plan and better teamwork to execute the plan. This advantage culminated in LX ’keeper John Marriott, making a good save but neither he nor the defence were able to clear the second shot. LX one down. Ten minutes later John conceded a second, which, because of the narrow angle, caught him by surprise. Up front, despite the best efforts of Peter Ross and Gordon Small, LX managed only the odd foray and to no avail. The second half was a repeat in terms of the score. The best of the Navy’s goals was a snapshot from the top of the circle. Number four was a short corner, equally close to both the left and right foot of the keeper! The second half was not however a repeat in terms of teamwork and goal-chasing. LX had, I think, two off the post, the best being from Adrian Money. In addition Gordon Small created a one on one opportunity which he usually wins, but not this time. Several forwards were thwarted with the ’keeper on the ground and the ball tantalisingly just visible. Brian Tubb and Sudesh Nayer were the pick of the LX team. It was great to see John Longden able to play even though still under treatment for another fortnight. Austyn Leaverland’s recovery from a hip operation is taking a long time despite great efforts to return to fitness. David Read made his ration of interceptions, Keith Hunt did well at inside right – yes inside right, Rod Cochrane wasn’t able to steal his usual goal, being closely marked. There were two ‘man of the match awards’, both were LX members playing for the opposition, but if you were not present you could be forgiven for not being able to guess who they were. Give up? Chris Jones and Barry Sewell. Barry excelled in the Navy goal. Several times in the third quarter the writer turned away because it was obvious we were going to score, to be sadly disappointed moments later. Chris, at inside right, orchestrated the Navy attack. 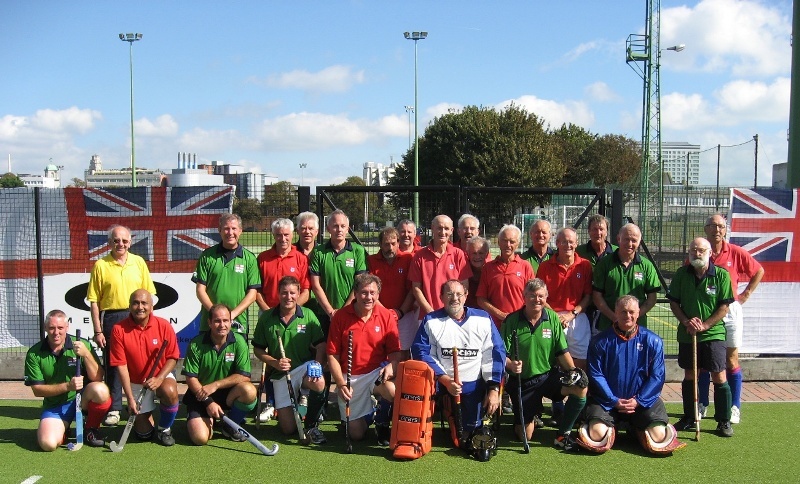 The event as a whole, was a trial run for next year’s centenary of the Royal Navy Hockey Association. At the end of the festivities, LX were invited to participate in that event on the 28th September 2008. Having secured the invitation, it is time now to liase with Alan Walker, Tom Darlington and his son Mark, who is the current chairman of naval hockey, to decide if it should be LX or England who plays, on what is a very important day for RNHA..
Everyone enjoyed the day despite the 0-4 result. Navy hospitality was as good as their hockey.